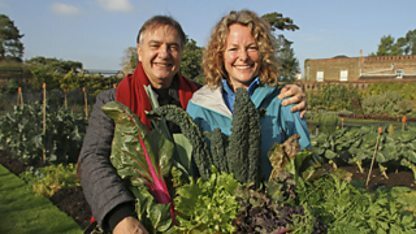 BBC iWonder - How do I make vegetables taste amazing? How do I make vegetables taste amazing? Are you overlooking the tastiest veg? Yet less than 27% of adults, and just 18% of children eat the recommended five-a-day of fruit and veg. Vegetables are mostly cheap, nutritious and readily available – so what’s the problem? We show you how to get the best out of vegetables, and convert even the most determined veg dodger. Raymond Blanc compares a properly cooked and an overcooked new potato. Most vegetables have a high percentage of sugars, but cooking is often required to release this natural sweetness. Dry cooking methods (e.g. roasting and frying) can counteract any inherent bitterness in vegetables by caramelising their sugars and intensifying flavours. This is called the Maillard reaction. It occurs when a coating of oil on vegetables heats quickly, causing moisture to evaporate from the surface. The result is a tender interior and a richly flavoured exterior with some crisp, caramelised areas. It is particularly effective when cooking roots, tubers and squashes. Though it will bring out the sweetness and tastes of most vegetables. Boiled vegetables soften faster than steamed, so boil roots for mash, but use a steamer if you want some crunch. However, steam is slightly more acidic than water, which will increase colour loss in green vegetables. Unlike meat, many vegetables will not tenderise at low temperatures. When slow cooking at less than 80C – as you might in a slow cooker – include a brief period at a higher temperature to avoid hard vegetables. 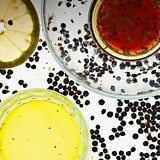 Why does lemon make peas taste sweeter, salt make tomatoes taste fresher, or a honey dressing make chicory taste less bitter? Find out how different taste combinations can enhance your vegetables. The image represents the six major taste categories: salt, bitter, umami, sour, chilli and sweet (clockwise from top left). Most foods contain a mixture of the six main tastes, but usually with one or two dominant tastes. Vegetables are usually either sweet, bitter or a mixture of both. 4. Are you overlooking the tastiest veg? These vegetables aren’t lookers but they certainly pack a punch on flavour. Click on the images for some delicious ideas for how to cook and eat them. Part of the celery family, it has a similar but slightly nutty flavour. Try celeriac remoulade as a sophisticated alternative to coleslaw, roast chunks with a little Marsala wine or add it to mashed potato for extra flavour. Anything spuds can do they can do better - almost. Mash them, roast them, bake them whole or make a healthier alternative to chips. They also cook faster than humble spuds so are good for busy cooks. Sprouts, but not as you know them. These tasty little spouts are particularly tender so should only be cooked very briefly – if at all. Add them to salads and sandwiches, or use as a garnish. Despite the name, it’s not actually an artichoke. Try this nutty veg roasted or in stews and soups. They are known for producing an unfortunate side-effect during digestion, but don't let that put you off. It's often said that you eat with your eyes and there's no doubt that attractive food is more enjoyable. But loss of colour goes hand-in-hand with loss of nutrients, so a basic understanding of how vegetables will react to different cooking techniques will help you get the best out of your veggies. Raymond Blanc makes mash and chips using different varieties of potato to prove just how significantly results will vary. Imagine mash made with salad potatoes, or marrowfat peas in a salad. Choose the wrong variety for your dish and it will be ruined. Potatoes are loosely grouped into waxy and floury varieties, based on the texture of their cooked flesh. Waxy potatoes (also known as salad potatoes) are smaller and best boiled or steamed. They maintain a firm, silky texture when cooked in water or stews. Floury potatoes are usually larger, with a fluffy flesh when cooked. These are best for chips, roast potatoes, mash and baked potatoes. Some potatoes are sold as all-rounders and tend to produce acceptable but unexceptional results in most dishes. Brown onions actually contain more sugar than apples, but the sweetness is disguised by the irritants that cause people to cry. Slow cooking removes the irritants and caramelises the sugars – adding a rich, sweetness to dishes. Onions we eat raw, for example spring onions and red onions, are rarely sweeter than brown onions but contain far less irritants, making them appear sweeter. Peas are unusual because we eat the young shoots, the seeds and the pods. Different varieties are grown to suit the part we will consume. Pea shoots are delicious when eaten raw or lightly cooked. Sugarsnap peas and mangetout are undeveloped pea pods eaten whole. Petits pois are young garden peas – smaller and sweeter, they make good soups and purées. Marrowfat peas are mature dried peas used in mushy peas. Even confident cooks spoil vegetables just by keeping them for too long. Find out which vegetables are keepers and which should be eaten as soon as possible. Like peas and beans, asparagus begins to deteriorate very soon after harvest. It does not freeze well so should be eaten when it’s as fresh as possible. Like other thick-skinned root vegetables and onions, squash store well in cool, dark, well-ventilated conditions – as much as 6 months after harvest. Choose varieties that suit your needs. Heads of lettuce store better than loose leaves, but even leaves can last a week in containers lined with kitchen paper. Cauliflowers, like broccoli, should be eaten within 2-3 days for the best flavour. Older cauliflowers have a sulphurous flavour and smell when cooked. 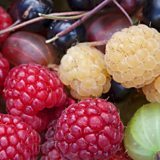 Are you making the most of British fruit?